It is time to grease your equipment. This means getting dirty. 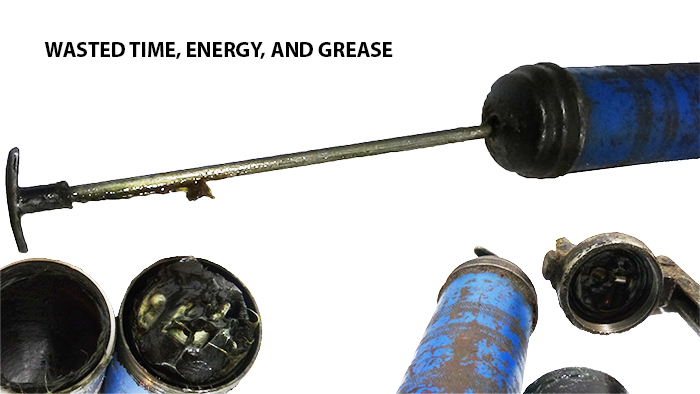 The grease gun is covered in grease, its leaking grease out from around the plunger/rod assembly, and it is probably sitting in a puddle of grease, but that’s not half of the problem. There is no guarantee it is going to work. If it hasn’t been used for a while it probably has allowed air to seep into the piston and an “air gap” has it stopped from pumping any grease. Or perhaps when you picked it up you noticed it was rather light and now you have to change the tube and that is a messy, cumbersome job that no one enjoys. The Lube-Shuttle® advantage is clear. The tube is easy to change. All you have to do is unscrew the cap, push on the plunger until 1/4 inch of grease is sticking out of the tube and then thread it in and start greasing! There is no leaking grease from the bottom of the grease gun as each tube has its own plunger and perfectly fits the inside of the tube to prevent leaking grease. This seal also provides the airtight seal to provide the vacuum that allows the grease gun to work without a spring or plunger pushing on the back of the tube! 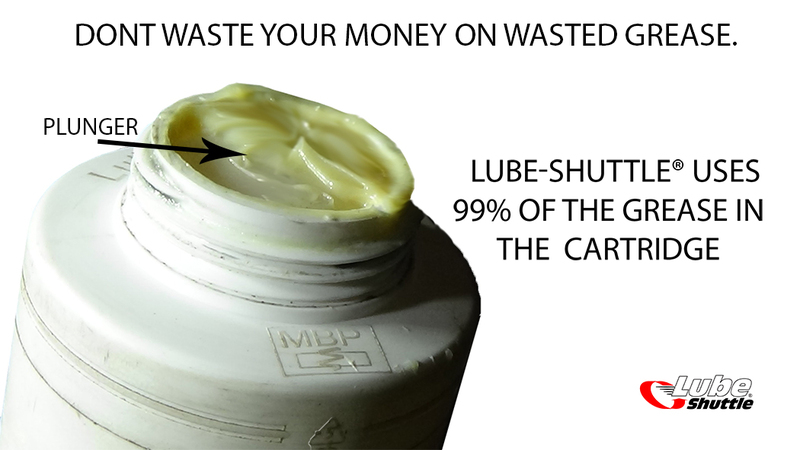 The Lube-Shuttle® System wastes zero grease. The grease does not leak out the bottom of the grease gun which not only costs money but also creates a mess that requires time and money to clean up! The LS cartridge completely cleans out as it uses 99% of the grease in the tube. The LS system when used correctly eliminates air gaps which means there is a lot less time spent getting the grease gun to work! Because it is cleaner and easy to use many companies find that their employees grease more regularly. By taking the headache out of greasing Lube-Shuttle® has removed any excuse not to grease! The tube can be changed anywhere, there is no reason to stop greasing to change a tube. Just put an extra tube or two in your pocket and start greasing, changing a tube is so easy and clean it can be done anywhere!